In July of this year the UN Commission on International Trade Law (UNCITRAL) announced that its newest convention would be titled the Singapore Convention on Mediation. It represents a game-changing moment for professionals and users everywhere who are seeking speedy, efficient, and peaceable dispute resolution, and casts Singapore securely into a well-earned leadership role in international adoption of the new Convention. 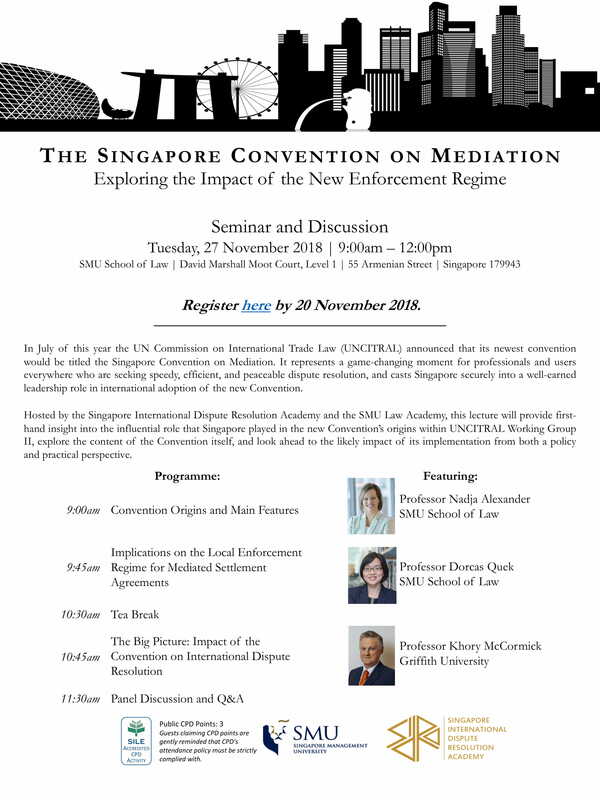 Hosted by the Singapore International Dispute Resolution Academy and the SMU Law Academy, this lecture will provide first-hand insight into the influential role that Singapore played in the new Convention’s origins within UNCITRAL Working Group II, explore the content of the Convention itself, and look ahead to the likely impact of its implementation from both a policy and practical perspective. Please register for this event by November 20 via this link.